I should probably say from the start that this is going to be a bit (only a bit!) spoilery. 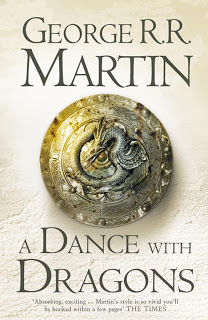 So if you are like me and prefer your A Song of Ice and Fire books to be completely unspoiled, here is my short review of A Dance with Dragons – It was GOOD! …And now for some slight spoilers. After sort of plodding through the last book, this one drew me right in with chapter after chapter about characters that I’d been dying to know about while reading the last book. Tyrion! BAM! Daenerys! BAM! Jon! BAM! Bran! …Meh, whatever! Generally, the book is as full of exciting things going on as the last one was slow. Not that the slowness of A Feast For Crows was that bad, but reading this made me realize just how little actually happened in the last one. This book made me feel really sorry for a couple of characters who I had never really liked (for obvious reasons) before, and with the first proper look at Ramsay Bolton (apparently he was in the second book, which I seem to have completely forgotten about? Haha! ), gave me a new character to despise. In fact, he made me wonder if maybe I had previously been a bit harsh on some of the other characters. Overall, the book was really gripping, and I got through it really quickly. I still have the same reservations about how women are treated in the books, and was really dissatisfied at the way that a certain character whose fate was uncertain in the last book was handled (I wanted details and I got a brief mention! Pfft! ), but those misgivings aside, I think it might be my favourite in the series so far. At the end of the book was a sample chapter from the next book, which I don’t really get. Normally these things seem to be put in to make you start reading and then really want the next book, but it’s just cruel to put that in when the next book won’t be out until… ??? So I chose not to read it. And now I’m happy, because nothing can spoil me for the series anymore! Until the next book comes out and it inevitably takes me ages to get round to reading it, hehe. To anybody who is struggling with A Feast For Crows now, or is wondering whether it’s worth carrying on, it definitely is!